Is making oneself heard as a woman challenging? It certainly is! Is that an obstacle though? Certainly not! It is an opportunity to say the least, a chance to voice what keeps you back and to help that change with time. The prestige of being at the World Economic Forum was an experience I had aspired to have at some point in my life and to have it this young and at the prime of my career, I feel privileged beyond measure. Several Pakistanis especially iconic women from my country have been part of this previously, women I look up to as leaders in their fields. My world certainly opened to different kinds of food, sharing a taxi, sharing cocktails and music, meeting people I had never imagined I would. Indeed I even met Karan Johar, whose movies we grew up watching, and I had the chance for my fan moment and shared it with millions of Pakistanis. The environment the World Economic Forum provided was meticulous in every sense: from the service to the attendees to the absolute paradise which was Davos in its sheets of white snow. My world opened here to seeing people making huge strides in my own country such as Shermeen Obaid Chinoy, Abid and Maheen, women leaders on the other side of our border such as Kanika, interacting with YGLs from Bangladesh and not to forget sitting across the table from the President of Switzerland. It had been exhilarating what had been packed into three intense days on topics that shape us today and require our utmost attention as the chosen global leaders, and also the unceasing and unfaltering entertainment which brought me to talk to leaders for collective goals, such as those of climate change, conserving water and refugees. Among these too lie Pakistan’s goals of health and education for us which, I with my friends and colleagues from around the world seek to work on in cooperation with Pakistani organisations to fulfil them. Every day is not a successful one, as much as people would expect that from a Member of Parliament in Pakistan, but spirits still remain high and every day goes by being the leader my fellow citizens and I want of me. Without taking a bold course of action and standing for something special, very little or no change comes about and what I want to see is a sustainable change in the lives of people of Pakistan- that population which lives on basic sustenance or scrape by their day. These people include women whose lives are dedicated to their families but are disregarded in the workforce and the country’s informal economy and are treated with violence and abuse. 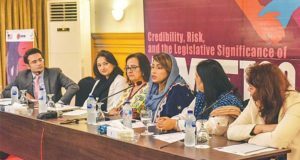 It took a long series of efforts, to bring in the sense of realisation in the provincial assembly of the gravity of the situation of women especially those who are working as informal labour. In Pakistan, we strive to cover the remarkable aspect of empowering women without crumbling the family structure, in balancing the male-female relationship and renegotiating it, while giving respect to women. The landmark domestic workers bill was eventually passed after tremendous advocacy, lobbying with fellow members of parliament especially the male groups who thought it was unnecessary to put a cap of regulations in ensuring women domestic workers get their rights. Similarly, the bill against hate speech has been another milestone, which directly promotes peace and builds a culture and environment of trust among the different communities living in the country, where the rights and freedom of all religions and ethnicities are respected and regarded. These actions are directed to restoring human rights and dignity for all Pakistani’s ensuring equal citizenship and access to justice. This means that as leaders and representatives of the people, we recognise the universal human rights covenants and give our citizens the same respect as of that in the rest of the world. As a young leader I feel, though this is a challenging task, actions like these are about taking the leap and working endlessly for the values one believes in. Only then can true peace and resilience be brought about. In isolation, very little is achieved, and through partnership and networking, a lot can be changed, for the better. While we host the third largest population of refugees in work, the efforts taken for this group of people at 1.4 million individuals is done in isolation, governments, civil society and refugee communities themselves need dire policy level support as well as direct interventions. Though the present government has announced some commitments in this regard, I seek to be engaged in this policy level matter in aligning the priorities of governments and the basic human rights of refugees which otherwise hinders the mobility and security of their families. Words might not do justice to the platform that is the World Economic Forum, but it sure does give the world a holistic agenda, a table for discussion and above all a strong resolve and commitment from passionate and eager leaders from around the world, and I have been honoured to play my part.